Michael Suddard: It's a Farm Boy Day! So Shop the Farm Boy Kitchen! It's a Farm Boy Day! So Shop the Farm Boy Kitchen! Sunday for lunch my wife and I decided to try out the Farm Boy Kitchen (665 Industrial Avenue, Ottawa). Located within the grocery store itself, the food is laid out in a buffet serve yourself hot table style format and billed by weight. Current pricing was $1.99 per 100 grams for salads and regular entrees plus $2.99 for 12 oz of soup. After selecting from an assortment of options including chili, soups, spaghetti and more, customers check out via the regular grocery store checkouts before being able to sit in the front food court style seating area or exiting the store to take their food home. We gathered our order, checked out and seated ourselves in the food court seating area. But we had made a big mistake. We didn't get the Farm Boy Salad Bar Card that entitles customers to purchase ten salads and receive one free. With out combined order we would have had two salads. We tried later on, with our receipts, to obtain a Farm Boy Salad Bar Card and load the points we would have had with the same cashier, but we were out luck and needed to do that at time of purchase. Ah well, at least we tried. The Order: "Power Packed Quinoa Veggie Chili" with Potato Salad and an Organic City Roast Coffee. After checking out and sitting down I noted I made a big mistake. I somehow had loaded up on twenty dollars worth of potato salad. That is one of the dangers of paying by weight, some foods weigh more than others and this potato salad was apparently pretty chunky in the weight category. The potato salad itself was quite tasty with potatoes sliced into chunks and mixed into a mayonnaise based potato salad dressing. Worth having again, but in lesser quantities. 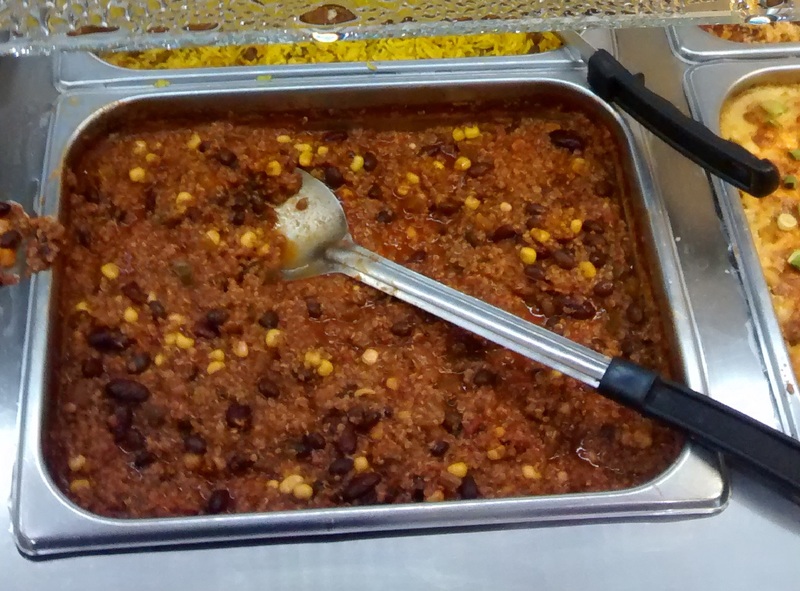 The Power Packed Quinoa Veggie Chili was indeed power packed. Yes, in the spice department! Otherwise the Quinoa chili was an interesting texture as I slowly ate it due to the spiciness. The Organic City Roast Coffee was labelled a "medium blend" but it turned out to be a little more of a dark roast. 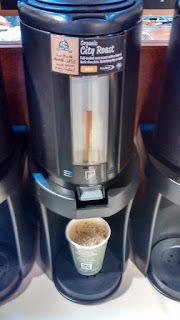 Sure the coffee was flavorful but a little strong on average taste buds. At $0.99 for a cup about the size of a Tim Hortons Medium and better quality coffee it's worth a trip. 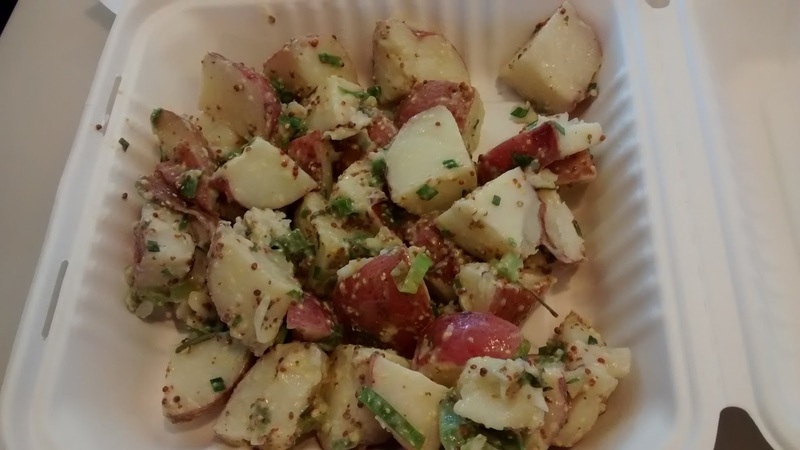 Overall, the Farm Boy Kitchen is worth the trip to try it out. Lots of selection to choose from but be careful in the weight department to avoid a nasty surprise at the check out. Apparently some people try to forgo purchasing the Farm Boy rice and instead cook their own at home while purchasing other items at the Farm Boy Kitchen like the curried dishes to save on cost but still take part in the convenience. If you're in the area for groceries and are looking for a quality lunch, the Farm Boy Kitchen is worth a look.